Technically it’s not 明天 anymore, but 今天. I was writing trying to write this post entry last night when, once again, I fell asleep in front of my laptop. Yes. First day of classes. Today I’ll have a history class. Then a Mandarin class. Huhuhu. It’s not the fact that school starts today that I forgot. It’s my Mandarin that I have forgotten. Summer came and went and I haven’t reviewed my Mandarin. Oh well, I still have a few hours to review my Mandarin. 加油! I thought I’m going to get a very low grade, but I ended up getting a decent one (given that I messed up my oral exams!). I realized that I could’ve gotten a higher grade if I only worked harder. I have to take 4 more Mandarin classes, so I have to study harder. It’s been 12 days since I last opened my Mandarin textbooks and it seems like I’ve forgotten more than half of what I’ve learned in the past few months. I must study this summer vacation! Here’s our final project for our Mandarin class. We were required to sing a song and make a music video out of it. We’ve kinda taken it seriously and I’m happy with our output. 🙂 This song has been playing on my head for many weeks while I was editing the video. I had fun doing this. 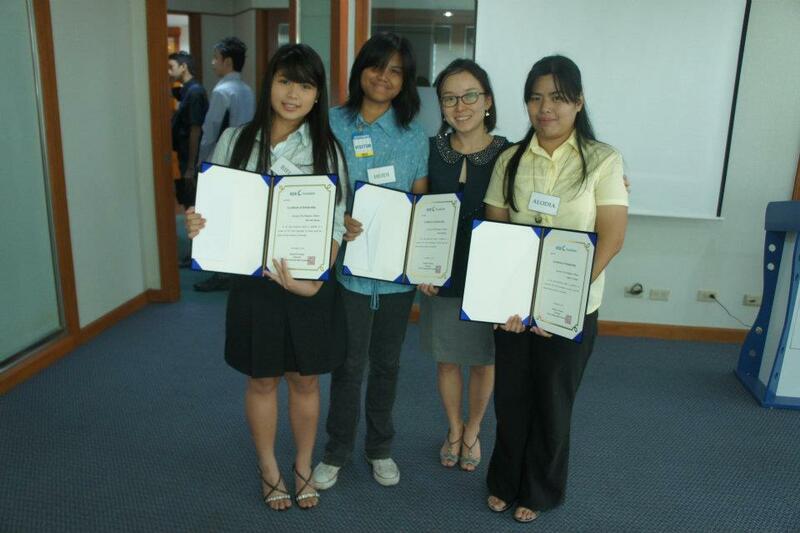 I love my groupmates! Why can’t these exams (alodia: papers too!) get over soon? Nothing goes inside, nothing is understood!!!!! I’ll not let you down in the next term, you’ll see. 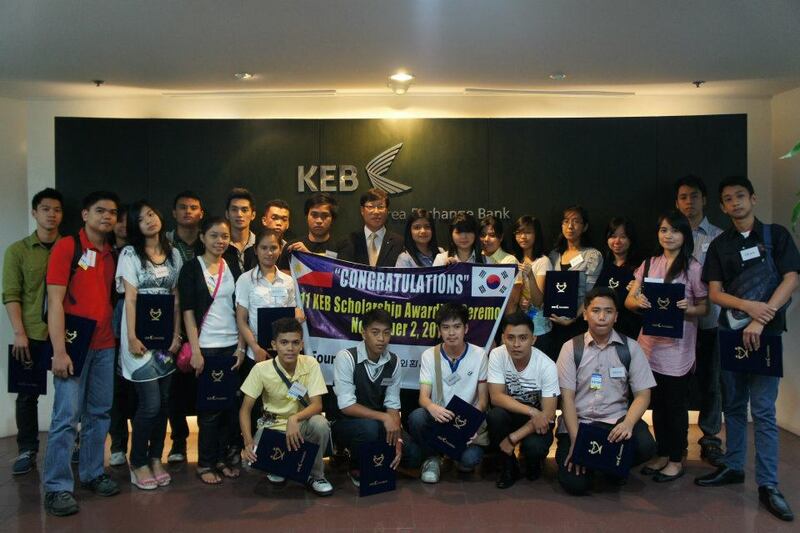 Last November 2nd 2011, I, along with about 20 other students from different universities in the Philippines, received a scholarship from Korea Exchange Bank. Our 선생님 encouraged us to apply for the scholarship and fortunately 5 of us from the University of the Philippines got selected. 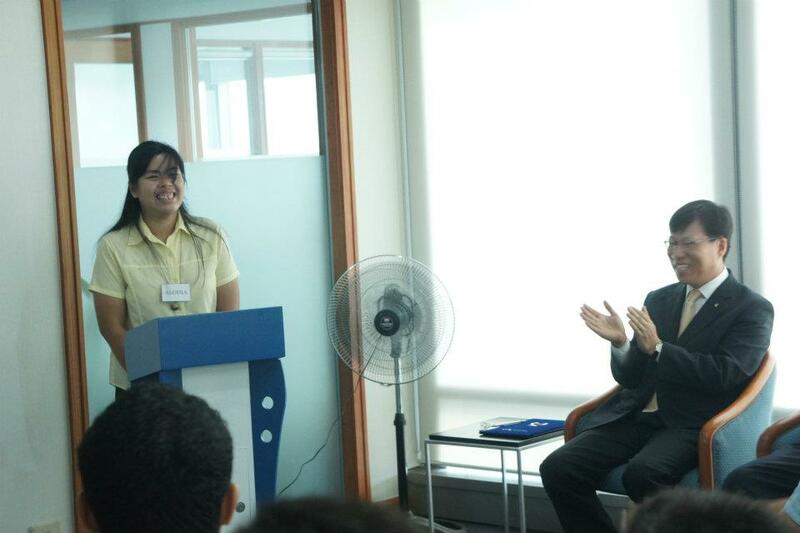 I was also asked to deliver a short speech during the awarding event. What I prepared was a bit long (I really have problems editing!). 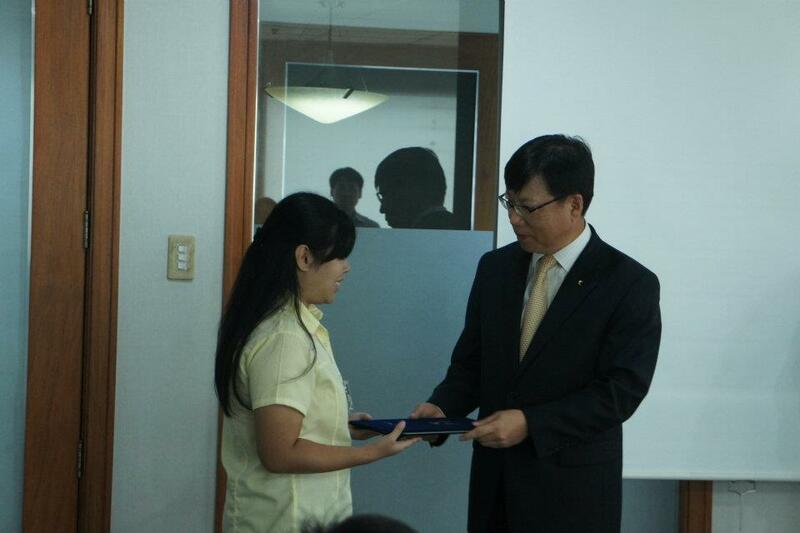 And I ended it with 2 or 3 sentences in Korean to the surprise of fellow recipients from other schools (the scholarship is not for Korean language students). I can't remember which part of my speech is funny to make the bank manager laugh like this. With my baby (pronounced as 베베) Riel. God knows how thankful I am to KEB. I probably would not have been able to enroll this semester if it was not for this scholarship. 앞으로도 열심히 공부하겠습니다. Once again, my sincerest gratitude to Korea Exchange Bank and to my lovely 선생님. I guess most of us here have our own dreams, right? A college degree? A stable and high-paying job? A house? A car? I have my own dreams too. Growing up in a single-parent home where my mother had to work very hard every day to make ends meet has made me dream big dreams for me and my mom. But due to financial problems, I had to quit school and take a permanent job in order to support our family financially. It was difficult for me. And at the age of 19, I stopped dreaming. But during that difficult time, I accidentally came across My Name Is Kim Sam Soon. Yes, the famous Korean drama. More than Hyun Bin’s killer smile, it was the main character, Sam Soon, that strikes me the most. She is just an average woman – not pretty nor attractive, not earning much, unmarried, not even young… yet she did not let anything nor anyone get in the way of her dreams and goals. She made me realize that I can also keep on dreaming despite difficulties and hardships. My fondness for Kim Sam Soon and the actress who played that character, Actress Kim Sun Ah, has sparked my interest in anything and everything Korean and I also started learning Korean language and culture. Somehow I also learned how Kim Sun Ah has worked her way through college by taking all sorts of part-time jobs; how she has to quit school to support her family; and how she, despite her age and busy work schedule, still managed to finally get her bachelor’s degree at the age of 34. With my rediscovered passion in learning and armed with newfound hope, courage and inspiration gained from actress Kim Sun Ah and her drama characters, I realized the value of education and I found my way back to school. Going back to school has been both exciting and challenging. It is, and will always be, a constant struggle especially for a self-supporting student like me. But I am blessed to have met wonderful people in our university. Like my Korean language professor who has encouraged me and taught me that I should not limit myself from great opportunities. For the past semesters, I have been doing well in my studies and I have managed to balance studying and working at the same time. But as I further my studies, academic demands are starting to get more and more difficult that I have to cut back on my working hours. Unfortunately prices of books, boarding and lodging, and other educational needs keep getting more and more expensive that I actually even thought of quitting schooling again, even for just a semester, so that I can make our finances stable first, before I continue with my studies again. It makes me sad that I have to resort to that decision, but this time I thought am no longer 19. And I have my dreams of become a Korean language educator and translator to hold on to and I am still determined to fulfil them, no matter how long it will take me to do so. I was actually in the middle of contemplating whether my decision to stop schooling temporarily is the right way to go, when I received the news that I got accepted in the scholarship program of the Korean Exchange Bank Scholarship Foundation. Words are not enough to express how glad and honoured I am to be a recipient of this scholarship. I saw it as a real miracle. The financial assistance that the Korea Exchange Bank Scholarship Foundation provided will be of great help to me in paying my educational expenses. I will no longer have to struggle with tuition or books this semester and it has lightened my financial burden which will allow me to concentrate more of my time for studying. The Korea Exchange Bank Scholarship Foundation has not only allowed me to continue studying, but it made me realize that it is worth pursuing high goals and believing that you can achieve them. From now on and moving forward, inspired by the “fighting” culture of Korea, I too, will continue “fighting” each day as I pursue my dreams. And I look forward to the day when I can “pay it forward” and be able to give encouragement, motivation and inspiration to future students like myself. 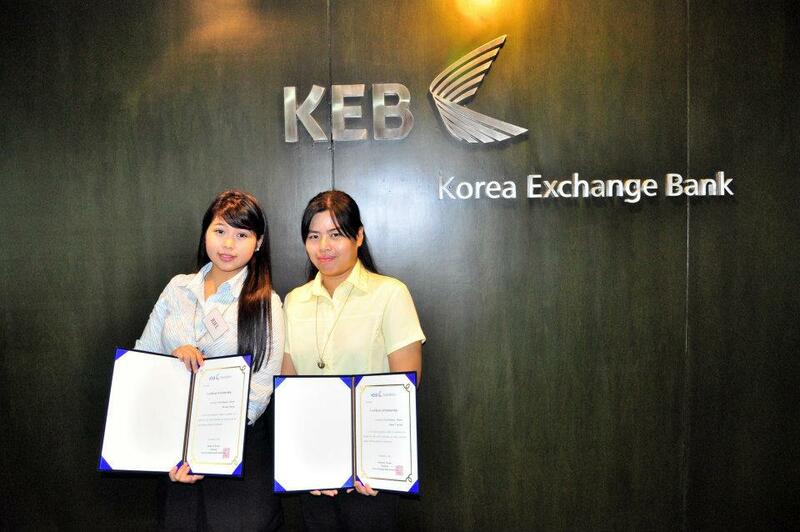 Once again, in behalf of all the recipients of the Korea Exchange Bank Scholarship, I would like to extend our heartfelt gratitude to the Korea Exchange Bank Scholarship Foundation for giving us this great opportunity. Gosh I missed blogging so much! Not only writing, but also reading other blogs that I follow. I currently have 256 unread blog updates subscription on my inbox! For the past months my blog has turned into a Kim Sun Ah blog! It was all because I really have nothing much to share regarding my Korean learning – or lack thereof. Yes, I haven’t been studying Korean lately! And I hate it so much! But I have no choice. I can’t even keep up with my classes last semester. So far, it was my worst semester (and I hope it was really the worst already)! With the most number of units with the most difficult classes. My sembreak plans? I want to do LOTS of things! But I know I only have a few days (noes!) and I definitely have to do part time jobs too (another no!). – Finish my ‘unfinished’ dramas! – Korean posts (휴기 쓰기) in Sunaforever! – clean up hard drives! Finally passing a Japanese exam! I’ve been failing my Japanese exams one after the other. And when I say failing, I mean like 3 out of 20-30 points! We have a total of 7 long exams for Japanese II and usually comprises of 4 parts: Short quiz, Grammar and Vocabulary, Listening and Kanji. I wished that I could perfect at least one set of exam. It may sound like a BIG dream for someone getting a score as low as 3, but the exams were pretty easy, I just don’t have time to study (ehem, linguistics papers overload, ehem!). Yesterday we had Exam 6 and it was an easy one – IF I had studied. I could easily get a perfect score, but since I didn’t study again, I only get passing scores. Oh, did I say it right? I passed!!! Haha! Finally! I actually got a perfect score (for the first time) on the short quiz part! Then passed all the other sections. Well, that’s good enough considering I didn’t study at all. And I still have a chance to perfect an exam. Because exam 7 is take home! Woot! Now my last worries will be the Finals! When I don’t think I’ll have time to review again because of other linguistics subjects that I mustn’t fail else I’m dead!